Neotinea ustulata varies between 10 and 50cm tall and has 5-10 broad, erect leaves at the base of the plant. The infloresence is dense initially but becomes more lax as the flowers open. 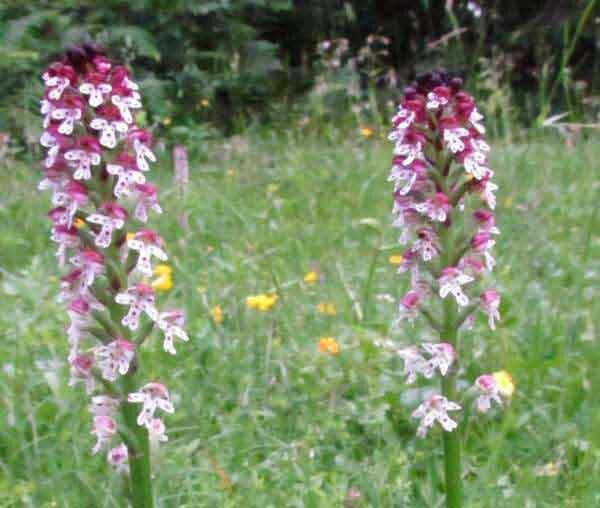 The buds are dark red and, as the lower flowers open, the oval flower spike becomes bi-coloured - white at the bottom and dark red at the top which is how it arrived at its common name - Burnt Orchid. 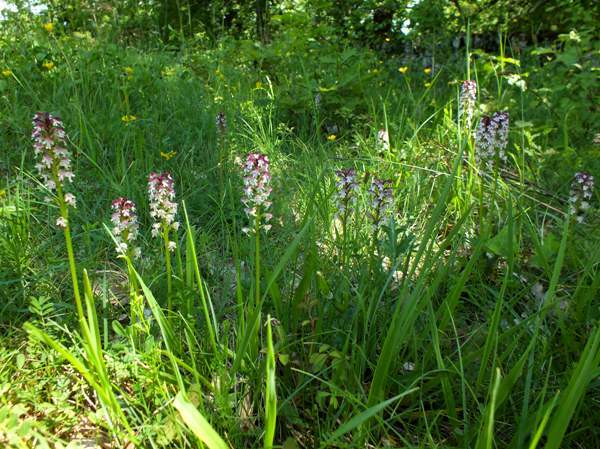 The Burnt Orchid is now very rare in the UK but still flourishes in parts of France and other European countries including Italy, Crete and Bulgaria. 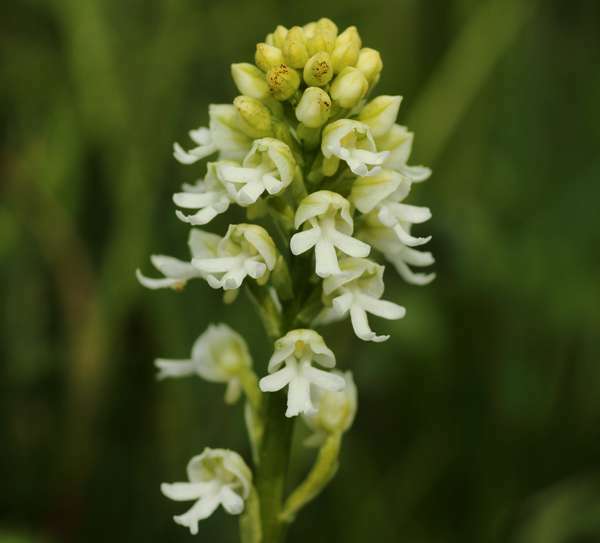 and Slovenia.Although first recorded in Britain in 1650 in the north close to Doncaster, this orchid is much better known from the south of England where there remain some larger colonies on the South Downs in Hampshire and Wiltshire. The UK and northern European plants (in Scandinavia, for instance) are much smaller in stature than those found further south in Europe which also flower slightly later in the year. 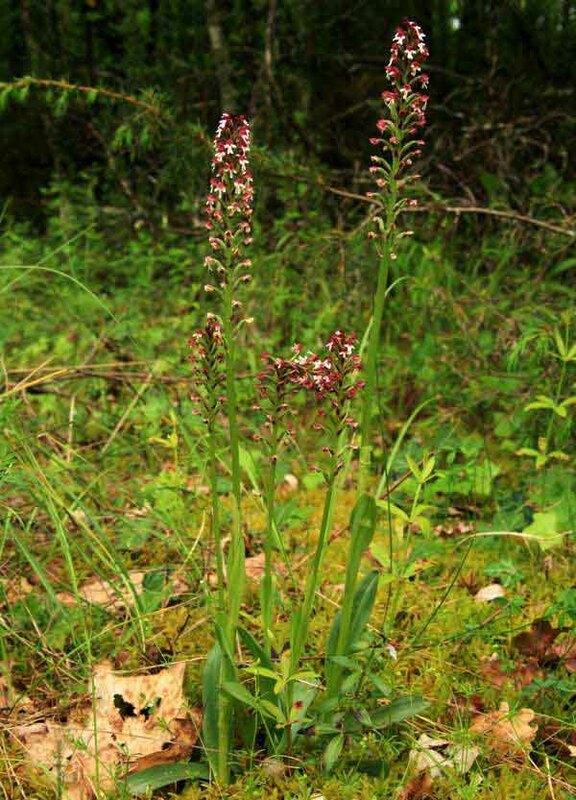 The infloresences of these taller Burnt-tip Orchids are much laxer, and these differences have led some to believe that the larger, later flowering specimens should be regarded as a 'variety' and are, therefore, sometimes referred to as Neotinea ustulata var. aestivalis. Rare in the UK but widespread in other parts of Europe. Its range extends from the Baltic States in the north to Spain and Italy in the south. In the south it becomes a largely montane species where it grows in unimproved summer pastureland. It is tolerant of alkaline and mildy acidic substrates and both dry and moist conditions. Neotinea ustulata var. albiflora with flowers that are completely white. Picture: Elaine Hagget. Neotinea ustulata occurs most commonly in short grassland on alkaline soils often at high altitudes. 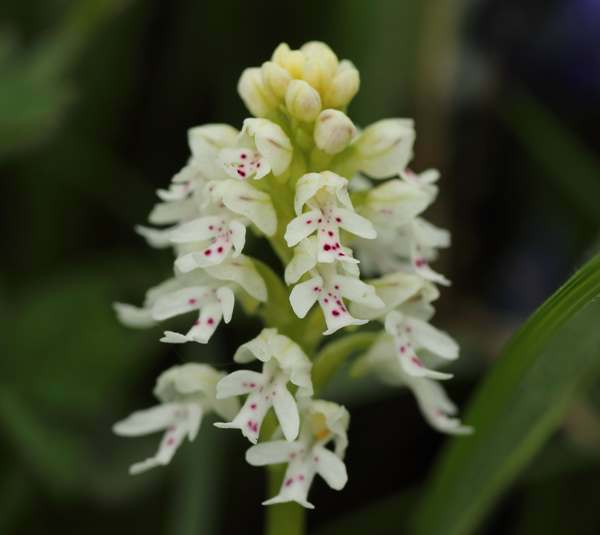 There are also completely white and almost white specimens of Neotinea ustulata found from time to time both in southern England and as far north as Derbyshire. These pale specimens are referred to as Neotinia ustulata var. albiflora. The specimen at the top of the page was photographed in the Lot Valley, southern France, in late May, and the final picture shown on this page was taken in the Gargano Peninsula area of Italy in mid-April. Neotinea ustulata var albiflora was photographed in southern England in May.